Over the northern summer there are two Systems conferences being held in England and one event. 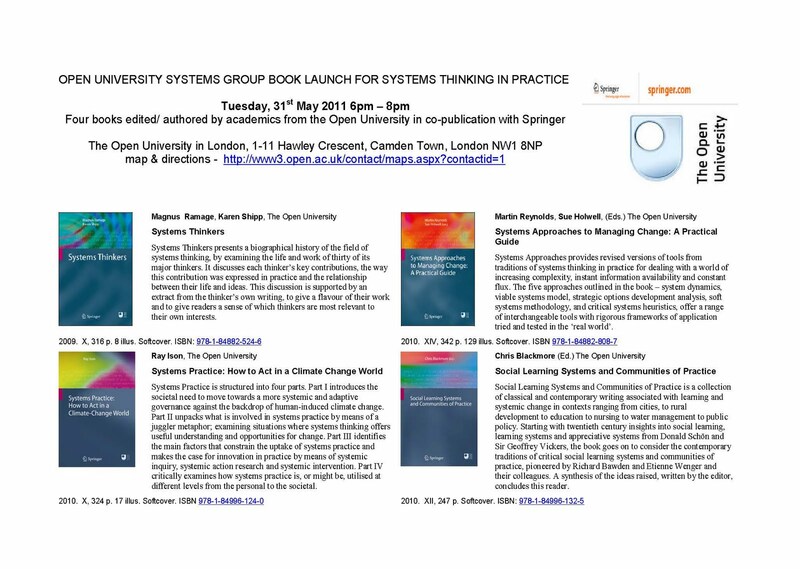 For anyone living in and around London or visiting on the 31st May you are cordially invited to a launch of our four new books prepared for the new MSc in Systems Thinking in Practice (STiP) programme at the Open University Office in London (Camden - see attached) from 6-8pm. (Please note the RSVP). The first conference is the ISSS conference at the University of Hull. The second is the UKSS conference. Details follow. For further background on STiP see my earlier posting. The 55th Meeting of the International Society for the Systems Sciences will be held at Hull University Business School, Hull, UK from July 17-22, 2011. April 30, 2011: The end of early, discounted registration. May 15, 2011: The deadline for full papers. Only ONE submission per registered participant will be accepted for the conference. June 1, 2011. The final deadline for abstracts, recognising that abstracts may not be developed into full papers for this conference. Only ONE abstract per registered participant will be accepted for the conference. June 1, 2011. The deadline for poster abstract submission. Posters are exempt from the one abstract/paper submission rule. There will be a welcome reception on Sunday evening, July 17. The conference banquet will be held on Thursday, July 21. Accommodation ranges from very well-appointed University rooms to mid- and upper-range hotels. Full papers are invited relating primarily to the areas outlined above. All submissions will be peer-reviewed by at least two members of the refereeing panel (in respect of academic works) or editorially reviewed by the general and programme chairs (in respect of accounts of Systems practice). 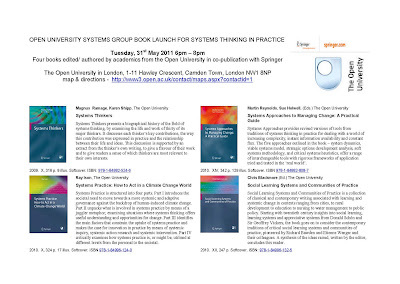 Papers will be available in electronic format during the conference, and a small number of high-quality papers will be selected for publication to a special edition of the Society¹s official journal, the Systemist, to be published following the conference. Please note that eligibility for publication in this special issue will also depend upon at least one of the authors registering for and attending the Conference. Contributors who do not wish to submit full papers can consider submitting posters. Posters will be displayed at special sessions during the conference. The Committee also invites ideas for a half-day workshop with the intention of selecting one as a precursor to the main conference event. Attendance of the workshop will be charged additionally to the main event. The selected workshop facilitator will be awarded a complimentary place to attend the conference. Workshop topics may vary and can include introduction to particular Systems methods and techniques that are of interest to the Systems community, hands-on practical applications etc. If you intend to submit a bid for a workshop, please explain in a single A4 page the aim and learning objectives of your proposal, the intended format, any special requirements for equipment, facilities or software etc. Printed poster dimensions should be no larger than A1 size and submitted electronically in .pdf, or .ppt format only to the same address as above submissions@ukss.org.uk . 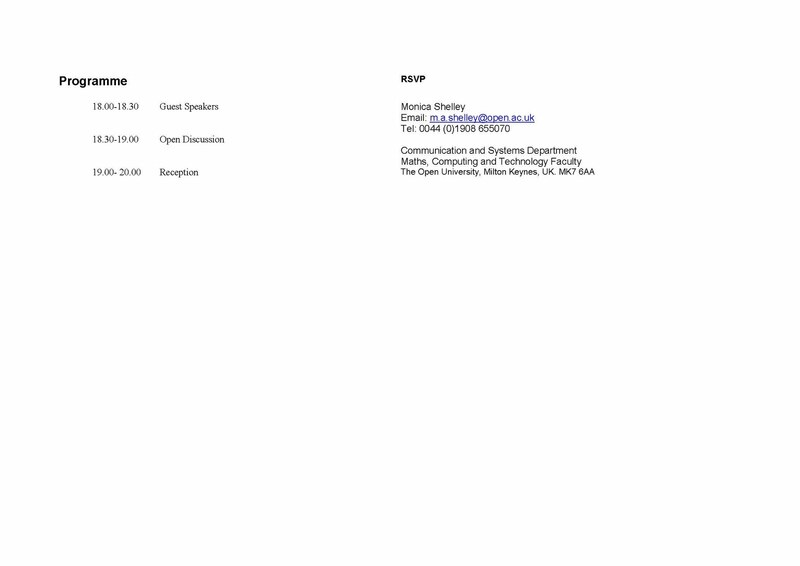 During the conference the UK Systems Society¹s annual general meeting will take place as usual. This is scheduled for September 1st, 5pm at the conference venue. 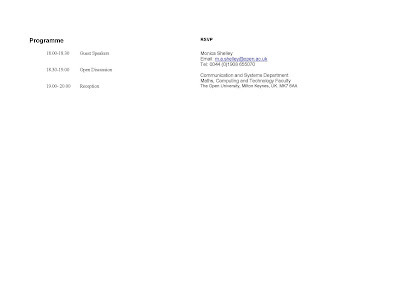 For fees and other details contact the organisers by emailing conference2011@ukss.org.uk or go to the web site. St Anne¹s College is situated in the heart of the University town of Oxford, conveniently placed for rail and coach links and within walking distance of the City Centre. It is situated in 5 acres of pleasant grounds. Accommodation is in modern rooms with tea and coffee making facilities. All conference sessions are in rooms adjacent to the accommodation.